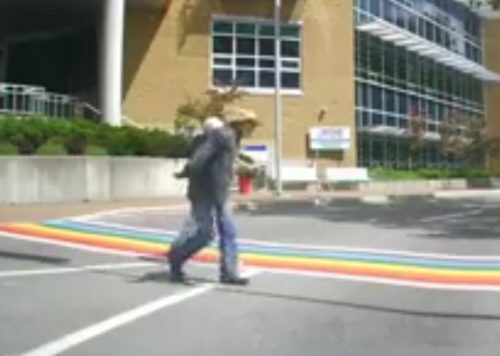 A ten-second dashcam video of a man spitting on a rainbow crosswalk has been viewed over 100,000 times. Corner Brook is a small town of 20,000 in Newfoundland and Labrador, Canada. In 2016, the small town got two rainbow crosswalks as part of its Pride celebration. Resident Lane Speckor caught a white man in a white hat on video spitting on the crosswalk, right in front of a woman he’s walking with. While the man might have just spit for no reason, that he wasn’t walking on the crosswalk and he spit in the direction of his companion has led many to believe that he knew exactly what he was doing. “It looks pretty deliberate,” said Stephen Dunn, a gay director who made the film Closet Monster. He also shot the first “Canadian Heritage Minute” with an LGBTQ story.